This is the “little black dress” of cookie recipes: a go-to chocolatey dough that's easy to dress up or down for totally different looks and tastes. Mix flour, baking soda and salt. Microwave chocolate and butter in large microwaveable bowl on HIGH 2 min. ; stir until melted. Add sugar, egg and vanilla; mix well. Gradually add flour mixture, mixing well after each addition. Refrigerate 15 min. Heat oven to 375°F. Shape dough into 1-inch balls; divide into thirds. Flavor each third with one of the variations as listed in tips. Place, 2 inches apart, on baking sheets. Bake 8 to 10 min. or just until centers are set to the touch. Cool 1 min. Remove to wire racks; cool completely. For plain Chewy Chocolate Cookies, prepare cookie dough and shape into balls as directed; place on baking sheets. Flatten slightly, then bake as directed. Jam-Filled Walnut Thumbprints: Roll balls of dough in 1/2 cup finely chopped PLANTERS Walnuts before baking as directed. Immediately make indentation in center of each cookie with back of small spoon; fill each with 1/4 tsp. raspberry jam. Cool completely. 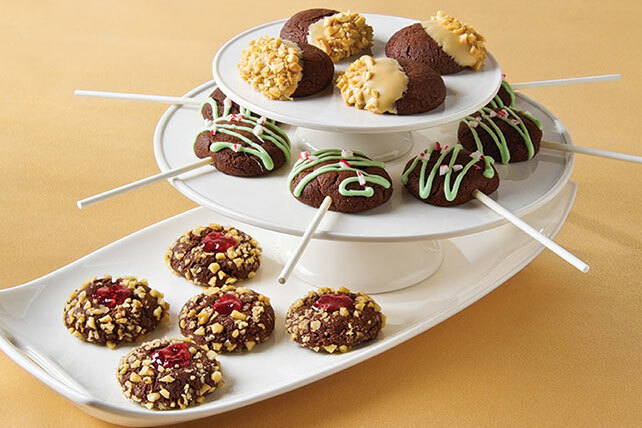 Chocolate-Peppermint Lollipops: Place balls of dough on baking sheets as directed. Insert lollipop stick into side of each ball before baking as directed. Melt 1 oz. BAKER'S White Chocolate; tint with green food coloring. Drizzle over cooled cookies on wire racks. Sprinkle with crushed peppermint candies. Let stand until chocolate is firm. White Chocolate-Peanut Butter Dips: Place balls of dough on baking sheets as directed. Flatten slightly before baking as directed. Cool cookies on wire racks. Melt 3 oz. BAKER'S White Chocolate. Stir in 2 Tbsp. creamy peanut butter. Dip cooled cookies in chocolate mixture. Return to wire racks. Sprinkle with 1/4 cup chopped PLANTERS COCKTAIL Peanuts. Let stand until chocolate is firm. Roll balls of dough in 1/2 cup finely chopped PLANTERS Walnuts before baking as directed. Immediately make indentation in center of each cookie with back of small spoon; fill each with 1/4 tsp. raspberry jam. Cool completely. Place balls of dough on baking sheets as directed. Insert lollipop stick into side of each ball before baking as directed. Melt 1 oz. BAKER'S White Chocolate; tint with green food coloring. Drizzle over cooled cookies on wire racks. Sprinkle with crushed peppermint candies. Let stand until chocolate is firm. Place balls of dough on baking sheets as directed. Flatten slightly before baking as directed. Cool cookies on wire racks. Melt 3 oz. BAKER'S White Chocolate. Stir in 2 Tbsp. creamy peanut butter. Dip cooled cookies in chocolate mixture. Return to wire racks. Sprinkle with 1/4 cup chopped PLANTERS COCKTAIL Peanuts. Let stand until chocolate is firm.